The Buxton Civic Association is very proud of its responsibility for many of the woods that circle the town and when walking the Ring of Trees, our circular walk through Buxton’s woodlands, their diversity should be celebrated. In this issue we have highlighted Corbar Woods and Shay Lodge Wood our marvellous resource for health and well-being in all seasons. Look at any 19th century print of the Crescent, such as the fine display in No6 Café or those frequently shown in the Art Gallery, and you will see a massively enlarged Corbar Hill in the background covered on its western side with trees. Corbar Wood, 54 acres – just over half the area of Grin Low Wood, is our only semi-natural ancient woodland, mentioned in a woodland inventory of about 500 years ago and possessing some of the signs of very old woodland: a magnificent area of bluebells which grow best in woodland and take centuries to spread; a vestigial and possibly mediaeval boundary ditch to protect the valuable coppiced trees; and the remains of a white coal pit, dug to provide super dried coppice branches which could create the higher temperatures than charcoal which were needed for smelting lead. In the early Victorian period when Buxton was being developed by the 6th Duke of Devonshire as a spa resort for the increasingly prosperous and numerous middle classes Corbar Wood was developed as a visitor attraction by laying out broad walks, rustic bridges, seats, shelters, and viewpoints, probably supervised by Sir Joseph Paxton, the Duke’s head gardener, engineer and architect. Nothing remains of the pretty rustic bridges and summer houses, and to get the views you have to walk higher up to Corbar Cross, erected by Buxton Catholics in 1950 to mark the Jubilee Year. Considering the popularity of the ‘Swiss Walks’ and the Victorian fascination with the developing art of photography, remarkably few photographs of the Corbar Walks, bridges and arbours survive among the large collection of historic photographs in the Buxton Art Gallery and Museum. The layout of the Victorian walks survives but over many decades their surfaces have been badly eroded and there is poor natural drainage as the rock beneath is impermeable gritstone. The annual autumnal leaf litter has built up and after rain and snow creates a potentially hazardous quagmire. Walkers naturally avoid these patches and so broaden the paths and extend the slippery areas. Over the last few years BCA has made a determined effort, mainly by Mike Monaghan and Alan Walker, and with valuable advice from Phil Beh-Mycock, to rebuild the surfaces of at least the public rights of way (also on the ‘Ring of Trees’ guided walk). Local quarries,Tarmac, Lhoist and Omya have provided many tons of aggregate and to High Peak Borough Council has made grants to employ a skilled professional path builder, Martin Wragg (Oak Tree Landscapes). this beautiful wood a much more agreeable experience. Some repaired paths are now even accessible to wheelchair users and buggies. We are very grateful to all who have made these improvements possible. The flora and fauna of Corbar cannot compete with the rich variety you can find in Grin Low Wood, especially the limestone loving flowers in the glades there: Corbar is no SSSI, but it has its own beauties. 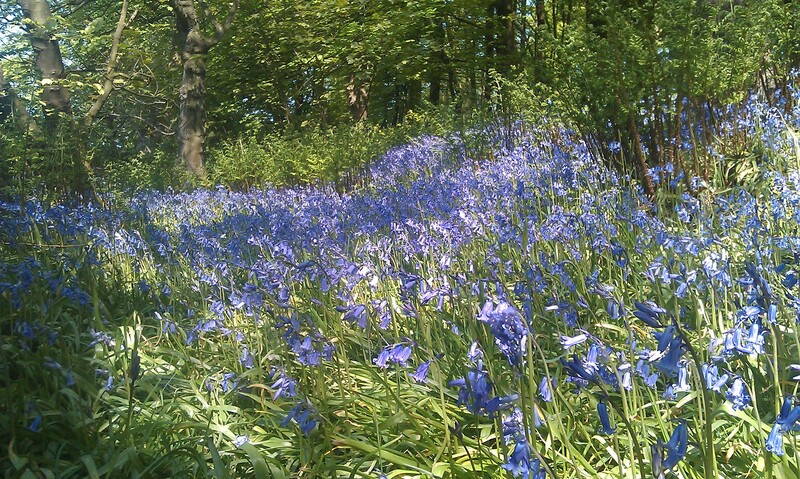 In May the bluebells in the far western part of the wood are a sight to behold, and the eroded old quarries below them provide dramatic contours – and challenges to local children to scramble up or slide down. There are some splendid veteran beeches, ancient yews and a few gnarled oaks. If you haven’t explored Corbar Wood yet, do spare a few hours to get to know it: you will find it very rewarding. If you ever wanted a wood for a perfect setting for Winnie the Pooh then here’s a perfect candidate. The winding path and impressive mature trees are pure, peaceful ‘storybook’. The exceptional views from the edge of the wood down towards Bishop’s Lane and Buxton itself make a local so proud of Derbyshire’s unique beauty. For a short walk from The Duke pub in Burbage go down Nursery Lane (opposite the pub and at the side of the churchyard). This becomes Bishop’s Lane. Walk down this beautiful straight lane, unusually lined with hedgerows, and take the left turning up a steep hill, to Plex Farm. Check out our events page to keep updated with news of what's happening at the Cavern, BCA activities including more updates of what's on in and around Buxton. 26th October – 3rd November (half term) plus competitions and free lollies! The cavern will be decorated with pumpkin lanterns. Can you count them all? The café will provide delicious themed soup and spooky biscuits. an independent future. There will be live music and a buff et. All welcome. Please phone Patty Hoskin 01298 72217 for tickets and more information. Thursday 21st November My Life Underground – A talk by Alan Walker. enthusiasm for the cave and his experiences of caving all over (or is it under?) the world. I know that it is his intention to continue to spend time in Buxton, but I suspect that in the near future, a great deal of time may be spent in St David’s establishing his new household, and in finding a new home for his pride and joy, "Bonnie Mae". All his colleagues in BCA wish him and Pam the very best of health and happiness in the gradual transition into retirement, and we look forward to seeing him at every opportunity when he does return in the future.